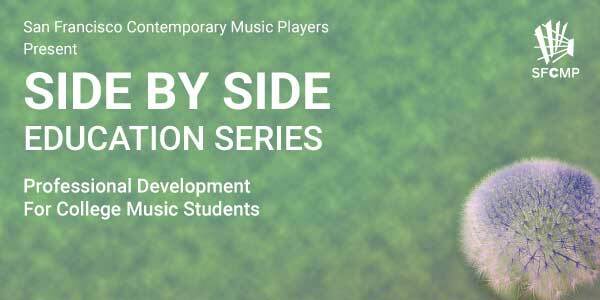 SFCMP is offering a side-by-side winter term performance opportunity which is open to all students at SFCM who play instruments in the above-mentioned categories. Registration for these opportunities will be on a first-come, first-served basis, subject to approval by SFCMP’s Artistic Director, Eric Dudley and Artistic Production Director, Amadeus Regucera. Through our in the LABORATORY Series, we explore large-ensemble contemporary classical works that push the boundaries of the concert experience. This season, we explore several points of connectivity along experimentalist paths, laid down by composers all seeking to fuse a variety of music forms and personal experiences into multi-faceted sonic narratives. An epigrammatic song by Charles Ives serves as a jumping-off point for California-based composer Ted Hearne’s ‘The Cage’ Variations, a panoply of musical influence and memory that incorporates the work of numerous others in addition to his own. Pieces by Ingram Marshall, Molly Joyce, and Mark-Anthony Turnage join together in further exploration of the theme – sometimes in the direct interaction of live performers with pre-recorded sound materials from places across the globe. Bay-area native Timo Andres’ Some Connecticut Gospel draws another line back to Ives, rounding out the program with a different take on the notion of memory and that which has been left behind us. Ted Hearne will join us on the program. Through the rehearsal process, each performer will discover new ways to relate to their instrument, challenging them to listen critically, to rethink their musical habits, and to develop new ways to approach music-making, both as an individual and as an ensemble member. We hope to encourage enjoyable and thoughtful collaboration between disparate musical disciplines, fostering relationships with the potential to last beyond the concert performance. To indicate interest, please email Lisa Oman, SFCMP Executive Director, director@sfcmp.org and Ryan Brown, SFCM Assistant Dean, rbrown@sfcm.edu. Once approved, you will need to sign up for Winter Term at SFCM. The San Francisco Contemporary Music Players (SFCMP), a unionized ensemble of highly skilled musicians, performs innovative contemporary classical music. We nourish the creation and dissemination of new works through high-quality musical performances, commissions, and community outreach. We promote the music of composers from across cultures and stylistic traditions who are creating a vast and vital 21st century musical language. We seek to share these experiences with as many people as possible, both in and outside of traditional concert settings. Led by Artistic Director Eric Dudley since 2018, SFCMP plays an important role in the regional and national cultural landscape. The most long-standing, continually performing new music ensemble outside the East Coast, SFCMP uses performances, collaborative projects, commissions, and educational outreach activities to give audience members and participants opportunities to discover musical repertoire that is new to them – and to use these experiences as ways to better understand, interact with, and enjoy their lives and our world. In addition to programmatic innovation, our performances are rooted in artistic virtuosity. Our 24 core musicians are among the Bay Area’s leading performers and educators. They are active as soloists and chamber musicians and leaders of several dynamic performance groups in California and beyond. Now embarking on our 48th season, SFCMP’s work has greatly contributed to the art form and the new music sector. A recent award winner of the Fromm Foundation Ensemble Prize, a ten-time winner of the CMA/ASCAP Award for Adventurous Programming, we have performed more than 1,200 new works by over 600 composers. Over 300 of these have been premieres, and we have commissioned some 80 new works from such composers as John Adams, George Crumb, and Julia Wolfe. SFCMP has been presented by leading cultural festivals and concert series including San Francisco Performances, Los Angeles Monday Evening Concerts, Cal Performances, the Stern Grove Festival, the Festival of New American Music at CSU Sacramento, the Ojai Festival, and France’s prestigious MANCA Festival.